Description: Detailed large political map of Nebraska showing cities, towns, county formations, roads highway, US highways and State routes. Nebraska is a state in the United States that is situated on the Great Plains of the mid-western part of the country. The largest city in this state is Omaha and its capital is Lincoln. The Indian tribes in this state consist of Otoes, Omahas, Iowas, Pawnees, Poncas, Missourias, etc. There was a time when the state was considered to be a part of the Great American Desert but now Nebraska is considered to be a top ranching and farming state. On its west Nebraska is bordered by Wyoming, on its east there is Iowa, on its north there is South Dakota and on its south there is Kansas. There are two time zones in Nebraska: the Mountain Time and the Central Time Zone. The highest point in this State is the Panorama Point, which stands tall at 5,424 feet. It is quite common for the state to experience powerful tornadoes and thunderstorms during summer and spring. Sometimes, they also strike in autumn. There are about 1,783,432 people living in Nebraska (2008 census) and its population is gradually increasing each year. The main ethnic groups living in this state are English, Irish, German, Czech and Swedish. 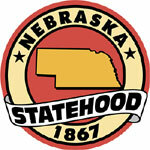 Nebraska is said to have the largest population of the Czech ethnic group in the country. Physical map and map image of Nebraska.